Refer to Brake Dust Warning. Always replace disc brake pads in axle sets. If the brake fluid level is midway between the maximum-full point and the minimum allowable level, no brake fluid needs to be removed before proceeding. DO NOT use any air tools to remove or install the guide pin bolts. Use hand tools ONLY. Install an open end wrench to hold the caliper guide pin in line with the brake caliper while removing or installing the caliper guide pin bolt. DO NOT allow the open end wrench to come in contact with the brake caliper. Allowing the open end wrench to come in contact with the brake caliper will cause a pulsation when the brakes are applied. Using a backup wrench to hold the brake caliper guide pins stationary, remove the brake caliper guide pin bolts (1). Remove the brake caliper and support with heavy mechanics wire. 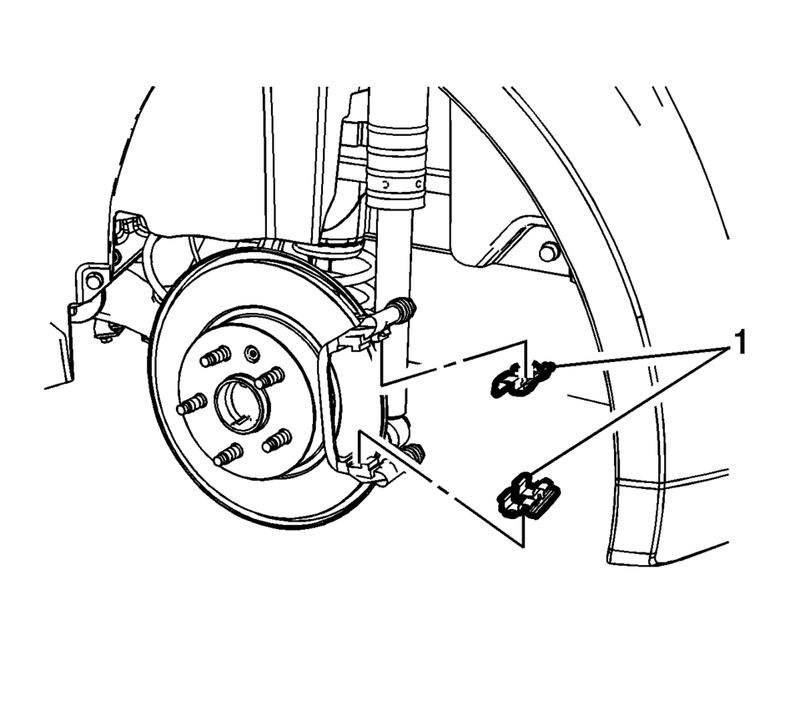 Remove the outer disc brake pad (1). Remove the inner disc brake pad (2). If replacing the disc brake pads, discard the springs. Remove the disc brake pad springs (1). Using a brake caliper piston spanner tool, rotate the caliper piston clockwise while applying pressure to the face of the caliper piston to compress the piston into the caliper bore. Thoroughly clean the contact surfaces of the brake caliper bracket of any corrosion or debris. If installing new brake pads, install new brake pad springs. Install the disc brake pad springs (1). 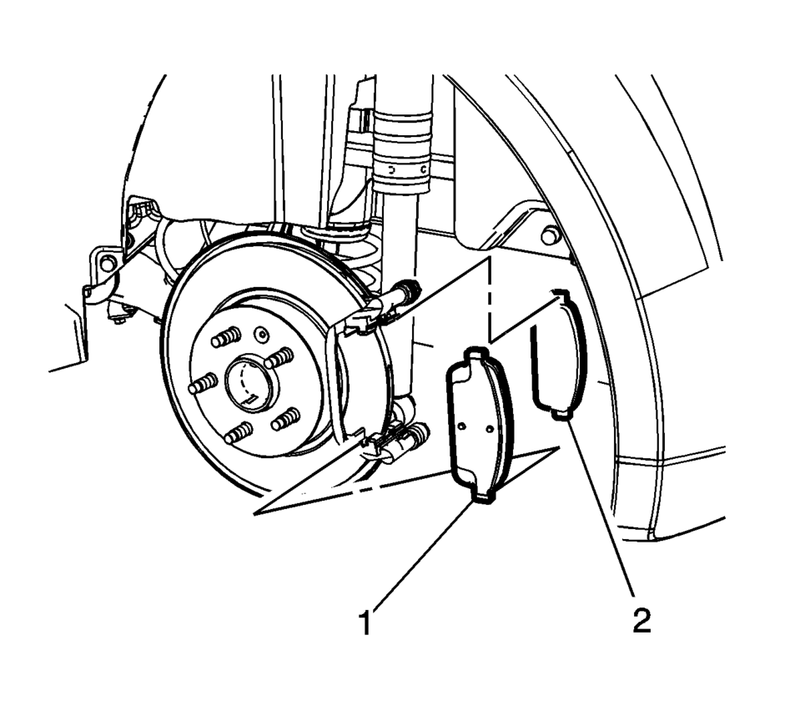 Install the outer disc brake pad (1). Install the inner disc brake pad (2). Ensure the notches in the caliper piston are properly aligned with the pins on the disc brake pad backing plate. Position the brake caliper over the disc brake pads and to the caliper bracket. Install the tire and wheel assembly. Refer to Tire and Wheel Removal and Installation. With the engine OFF, gradually apply the brake pedal to approximately 2/3 of its travel distance. Wait 15 seconds, then repeat steps 9-10 until a firm brake pedal is obtained. This will properly seat the brake caliper piston and brake pads. Fill the master cylinder reservoir. 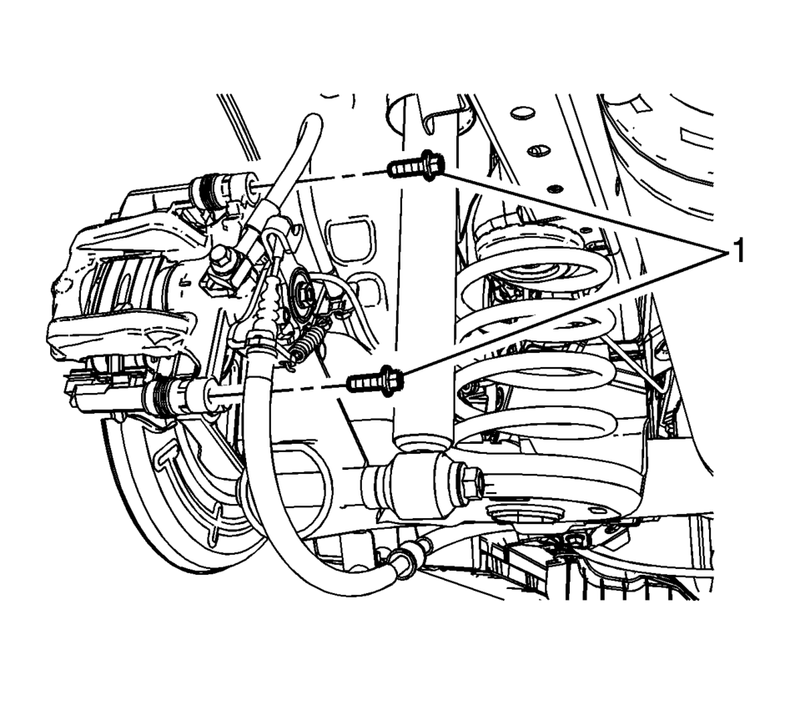 Refer to Master Cylinder Reservoir Filling. Burnish the brake pads and rotors. Refer to Brake Pad and Rotor Burnishing.